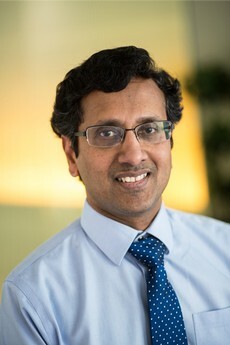 Gurumurthy Ramachandran has conducted research in various areas relating to human exposure assessment in occupational and non-occupational settings. His research has included the development of robust occupational exposure assessment strategies for a variety of airborne contaminants. He has pioneered the use of novel Bayesian statistical methods that synthesize exposure models, monitoring data, and probabilistic expert judgment. He has been at the forefront of research in occupational hygiene decision-making, and developing mathematical methods for exposure modeling and analyzing occupational measurements. Additional areas of expertise include developing exposure assessment methods for nano-particles and the use of expert judgment in risk assessment for nano-materials, and nanotechnology policy in the areas of occupational health and nano-medicine. He has served as a member of the Board of Scientific Counselors to the National Institute of Occupational Safety and Health (NIOSH) and advisory committees for the National Academy of Sciences (NAS) and the US Environmental Protection Agency (USEPA). He is also serving on the editorial boards of the Journal of Occupational and Environmental Hygiene, and Journal of Occupational Safety and Health. He has a Bachelor's degree in Electrical Engineering from the Indian Institute of Technology, Bombay, a Master's degree in Environmental Engineering, and a Ph.D. in Environmental Sciences and Engineering from the University of North Carolina. 1. Faculty Excellence in Advising, School of Public Health, University of Minnesota, 2015. 2. Elected American Industrial Hygiene Association Fellow, 2014. 3. Faculty Excellence in Teaching Award, Division of Environmental Health Sciences, School of Public Health, University of Minnesota, 2012, 2014. 1. Member of NIOSH Study Section (SOH-1). 2014-present. 2. Member, Board of Scientific Counselors, National Institute for Occupational Safety and Health (NIOSH), 2006-2011. 3. Member, Scientific Advisory Committee, Alcoa Corporation, 2012-present. 4. Institute of Medicine, Board on Military and Veterans Health, Committee on Making Best Use of the Agent Orange Exposure Reconstruction Model, 2007-2008. 5. Editorial Board Member, Journal of Occupational and Environmental Hygiene, 2004 - present. 6. International Advisory Board, Annals of Work Exposures and Health, 2017 - present. 7. Member, Exposure Assessment Strategies Committee, American Industrial Hygiene Association, 1998-present. Selected Publications from the last five years that show my interest areas - exposure models, decision making, exposure assessment in epidemiological studies, Bayesian methods, and indoor air pollution in India. Shao, Y., Ramachandran S, Arnold, S., and Ramachandran, G. Turbulent Eddy Diffusion Models in Exposure Assessment - Determination of the Eddy Diffusion Coefficient. Accepted for publication in Journal of Occupational and Environmental Hygiene, 2016. Arnold, S.F., Stenzel, M., Drolet, D., and Ramachandran, G. Using checklists and algorithms to improve qualitative exposure judgment accuracy. Journal of Occupational and Environmental Hygiene, 1:1-36, 2015. Choi, J-Y, Baumgartner, J., Harnden, S., Alexander, B.H., Town, R.J., D’Souza, G., Ramachandran, G. Increased risk of respiratory illness associated with kerosene fuel use among women and children in urban Bangalore, India. Occup. Environ. Med. 72:114-122, 2014. Banerjee, S., Ramachandran, G., Vadali, M., Sahmel, J. Bayesian Hierarchical Framework for Occupational Hygiene Decision Making. Annals of Occupational Hygiene, 58 (9): 1079-1093, 2014. Hwang, J., Ramachandran, G., Raynor, P.C., Alexander, B.H., Mandel, J.H. A Comprehensive Assessment of Exposures to Elongate Mineral Particles (EMP) in the Taconite Mining Industry. Annals of Occupational Hygiene, Vol. 57, No. 8, pp. 966–978, 2013.